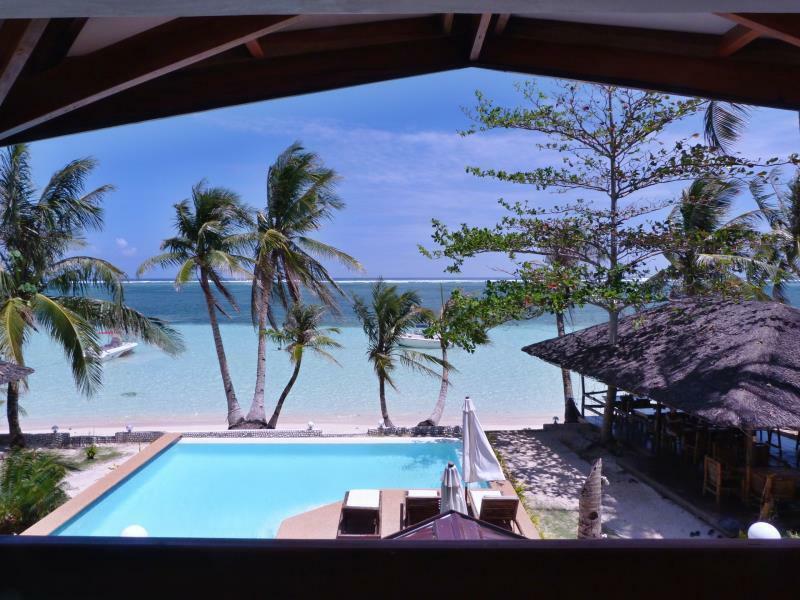 "Our room has the ocean view , the balcony is a perfect place..."
Have a question for Romantic Beach Villas Siargao Island? "Staff were fantastic as I arrived very early the next day ." "Best thing about place is it has a wide and near beach front." "The rooms were massive and well appointed, the grounds were well maintained, the staff were amazing, the restaurant (and free breakfast) was brilliant and the i..."
"Pros: Location is great since it is beach front where you se..."
Romantic Beach Villas Siargao Island is a great place to enjoy your holiday, relax, and rehabilitate your soul. This 3-star resort with an excellent infinity swimming pool is placed on the best fine sand beach in the area, only two kilometers from the famous Cloud 9 surf spot, the best in the Philippines. The resort's excellent location provides easy access to many must-see spots and various water sport activities, island hopping, and the area's best attractions. The resort offers scuba diving, speed boat trips, wakeboarding, snorkelling, kayak rentals,surfing lessons, game fishing, motorbike rentals, and more. A location just half a kilometer from General Luna allows easy access to local bars and nightlife atractions. 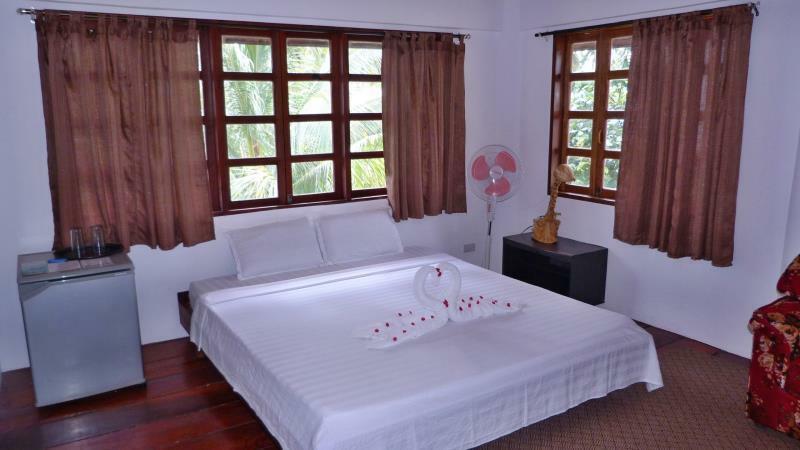 Romantic Beach Villas Siargao Island also offers many facilities to enrich your stay in Siargao Island. For the comfort and convenience of guests, the hotel offers a beach restaurant with an unforgettable view, car park, 24-hour room service, babysitting service, and airport transfers. Guests can choose from eight rooms, all of which exude an atmosphere of total peace and harmony. The hotel offers fantastic facilities, including massage treatments, a golf course within three kilometers, a spa, a garden, and an outdoor infinity pool to help you unwind after an action-packed day in the city. When looking for comfortable and convenient accommodation, make Romantic Beach Villas Siargao Island your home away from home. "Pros: - Romantic Villas is situated close (walking distance)..."
We had to move to this room since there was only two of us left during the trip. The room was smaller, of course and is located at the second level of the main building. Toilet didn't have bidet like in the villa but that's not really an issue. Less space also since you only got a room unlike the villa. For the amenities, the pool was nice and had a view of the sea. We loved hanging out by the pool. Though we would like the billiard sticks to be replaced since it didnt have rubber/ the blue part anymore. Enjoyed our stay at the garden view villa. The room is spacious and beds were comfortable. We had aircon and fans, as well as bidet and hot shower. Basic things that we are looking for in a hotel. Rate was inclusive of breakfast but because we had to leave for the tour early, we requested for sandwiches to be prepared the night before. Serving is big enough to fill our tummies for the morning activities. Though, it would've been better if the rice meals could be packed too. We never had to buy water because we get one bottle a day Loved that we had plenty of sockets and space to hang our wet clothes. we arrived 5hrs. ahead of the check-in time we even able to eat our breakfast. you can swim to their beach, it is a white beach. nice pool overlooking the nice beach. foods are really great. the welcome drinks are instagram favorite. the welcome board was really heart warming to see your name artfully designed on the board. Nice place and location. Pool is small and food is quite expensive. Good customer service. I hope they are more careful in the spelling of the names of their visitors. I told them the spelling of my surname is incorrect but they still did not change it in the welcome board. Spent 12 days there and we loved it. The cool relaxing pool on warm days after tramping around, the bar overlooking the beach, the seafood an dpizza restaurant, the charter boat, the Cemetery surf spot just in front, excellent spa next door, bars and restaurants at a wlaking distance in the area, good bikes rentals at the hotel, and most of all smiling and relaible staff. All what you need for a good holiday. The hotel is good, pool is great. Location is quiet and surfing off the beach in front. Owner runs a good operation, small details are all looked after. Problem is, I pay for a hotel to relax and have a good sleep. Unfortunately, they have 2 dogs who bark, no joke, ALLLL night long. Tide is low, guys are collecting shellfish from the sand , but their smell awakes the dogs who come out literally every 1 hr to stand beside the rooms and bark. And then bark some more. And its loud annoying and impossible to sleep. I cant believe how crazy it is to have such a nice resort with all the small details like flat screen tvs, great air con etc. But they dont keep dogs quiet at night. ZERO chance anyone get can slee thru the night when the dogs come from the back of the resort and BARK all the way to the beachfront. Im sorry, but I pay a hotel so I can have a good sleep. That is NOT possible when there are 2 dogs who bark and bark all night long at the fisherman. 11pm-4am they bark. We enjoyed our at the villa. The location was excellent since it is walking distance from the main street where the food is, yet where it is located is quiet and not a lot of noise. Facilities like the pool and the bar were great, but the aircon in our room was noisy. The management should have changed it since it was already an existing and persistent problem before we arrived. Although we didn't make a big fuss about it (just asked once to have it fixed but the issue remained), but it would have been nice to have a peaceful sleep all throughout our stay (and we can't move to another room since it was fully booked). Overall, I will still recommend them (just request not to sleep at the villa at the back). Thank you for a wonderful stay and hope to be back soon! Great location, fantastic facilities , beautiful resort and wonderful staff. Booked the last room available 2days before our scheduled flight and we can say that we made the right decision! We enjoyed our honeymoon trip because of this resort. :) Staff were very nice and accommodating. Breakfast is superb! Will definitely go back to this place with our family. THe food was awesome, the room is quite big (3 bed with loft). Aircon works fine, it's a bit oldschool so it takes a while to cool up, but it does the work. The bathroom has hot shower available. It's pretty basic (the bathroom). The beach was hard to swim on due to low tide, so the inhouse swimming pool is a BIG PLUS! We love to swim and we used that pool everyday. Surf area is about 5 minutes away by tricycle/tuktuk. No extra charge if paying via credit card. Super satisfied with the service of the hotel and restaurant. id stay here again. Im not a surfer but loved the hotel because of it's location and the beach was beautiful! If i surfed, id still stay here because you will have the best of both worlds in Siargao! Nice beach and a great surf town! Fantastic place.Great beach & location walking distance to bars & restautants.Great relaxed atmosphere. Rooms are good. Also pool overlooking beach.Kayaks & paddleboards for free which was good fun.!! Can also arrange transport & trips.We went on speedboat was great.The food was good & staff were amazing very helpful & always smiling & singing.!! Will stay here again when in siargao.Highly reccomend this place. Mark & Rochie uk. First impression was the hotel was well maintained and clean with friendly staff. After staying there 6 days it became like home from home and nothing was to much trouble when you asked the staff to go the extra mile. Siargao is a gem and the Romantic Beach Villas didn’t disappoint. The staff was very friendly and went above and beyond. Perfect location and a great vacation choice. We spent the last 2 nights of our vacation here. We loved hanging out by the infiniti pool, and in their covered lounge area right on the beach. The property is on a beautiful stretch of beach with palm trees and crystal clear waters! We stayed in a little cottage with a lovely veranda opening up onto a beautiful, lush garden. The accomodation we stayed in was a spacious loft. We had breakfast included which was a la carte (a nice bonus). We enjoyed delicious pizza, cucumber mocktails and a fresh watermelon smoothy everyday. This place is right in the heart of all action as well. We would definitely stay here again.